Following the release of v1.0.0 on September 7th.2017 Ghost has been officially removed from the Softaculous script list which renders this tutorial obsolete. However, we have created a custom management plugin for ghost via which you can deploy the latest version with the same low wait time. 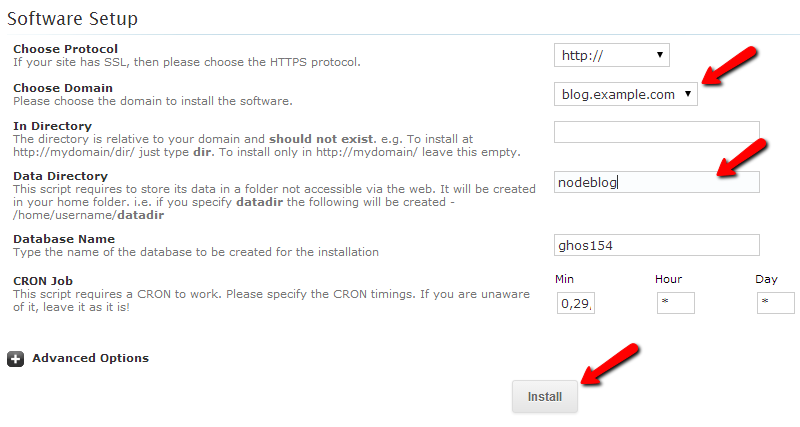 In this tutorial we will show you how to install install Ghost via the Softaculous auto-installer. Softaculous is an easy to use cPanel addon which allows you to install more than 150 scripts with just a few clicks. To access Softaculous please login your hosting account cPanel and scroll to the Software/Service section. From the Softaculous main page expand the Blog category on the left and click on the Ghost link. Via the Ghost Softaculous page you may review features, ratings and Ghost Screenshots. For this tutorial we will proceed with the installation process by clicking on the Install button from the navigation menu. On the Ghost installation page, please select the domain or subdomain for which you would like to install Ghost and set your Data Directory. The Data Directory can be any name of a folder under which your Ghost data will be stored. It is not directly related to the URL via which you will access your Ghost blogging platform. For the purpose of this tutorial we will simply use 'nodeblog'. When you are ready with your settings, click the 'Install' button to complete the installation. When the installation process is over you will be displayed with all the needed information to access your Ghost blog and the Ghost administrative dashboard. If you would like to have your Ghost blog running on the standard HTTP port in order to use a more clean and easy to remember URL, please follow our tutorial on How to configure Apache proxy for Ghost in cPanel.